We don’t even want to fixate on the rank. HR management software CakeHR has done it again – We’re featured as a HR solution market leader by the preferred review site of savvy buyers, GetApp. Q1 of 2018 sees us sitting pretty at #7 – the same rank as Q4 of 2017. On a platform that recognizes 286 unique HR products, snaring a spot in the top 10, not once but repeatedly, is a testament to our commitment to keep growing. We are vigilant of trends on the horizon. And we watch our competitors – hawk-eyed – to ensure the best in class features for our loyal users. It’s a lot of work. But the strategy is paying off. Why do these mentions by GetApp have us stoked? GetApp boasts over 250,000 reviews of 7000+ software solutions. When people love a tool, they go to GetApp to brag about it. GetApp is literally the pioneer of software and app directories and it’s approach has been emulated by Google. Most importantly in the era of false news and algorithm manipulation, GetApp maintains the sanctity of its research and ranking by subjecting each category leader candidate to a rigorous 5 criteria test. If you’ve ever looked up a software or an application, chances are you’ve made your way either to GetApp or to its sister sites of Software Advice & Capterra. When GetApp speaks, the software community listens. Transparency and attention to detail are the name of the game. GetApp ensures that a comprehensive snapshot of public opinion and tool performance are taken into consideration when creating these category leader lists. In short, you can’t trick the system by focusing on one aspect of your software and neglecting everything else. GetApp scours reviews for a particular tool, not just from its repositories but from the databases of Software Advice and Capterra. This is done to get an unbiased view of what users think of a solution. It is quite impossible to manipulate opinions on three leading sites! Factors such as total number of reviews, the average rating from these reviews and the recency of the feedback are of paramount importance. Each tool is evaluated based on how well it stacks against the average number and rating for that category on GetApp. Reviews written in the past 6 months earn 10 points, reviews written between 6 to 12 months receive 6 points and feedback that is more than a year old gets 4. There is a total of 20 points to be had from reviews. CakeHR has scored 16 out of 20. This means most of our reviews are positive and they are fairly recent to boot. Yes, we capitalize on obvious review opportunities like a particularly happy client who raves about our customer service. But given how hard it is to get one spontaneous review, our performance in this regard leaves no doubt that we set the right expectations and deliver on our promise to simplify HR. Feeling the love for CakeHR?❤️ You can leave us a review here and here. A software solution that works in isolation can never realize it’s full potential. It needs to be where it’s users are. And today this means popular tools like Slack and G Suite. GetApp recognizes how integrations make life more productive. Candidates get 10 points on the basis of the number of integrations they have as compared to their category average. They are then scored 4 additional points on the basis of the volume of integrations they have when stacked against the other category leaders. They can earn 6 more points for having a Zapier integration and an open API. CakeHR connects out-of-the-box with Slack and with G-Suite. This means leave notifications can pop-up in Slack channels and employees are always on the same page. Meetings become easier thanks to auto-syncing with MS Outlook, Google Calendar and Apple iCal. Today workers aren’t tied to their desks. They must have access to information and features on the go. This is especially true for Human Resource which deals with people driven contingencies and emergencies. 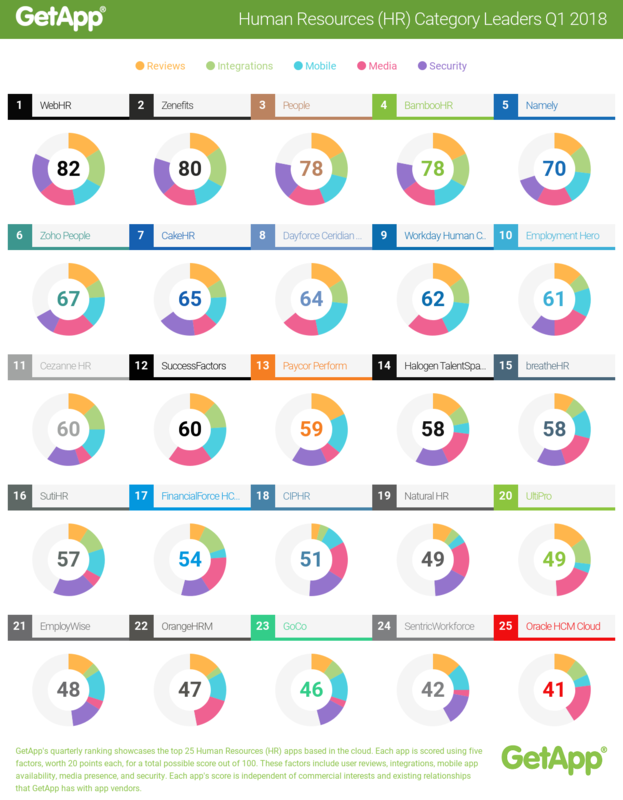 GetApp scores tools a total of 20 points for their mobile presence. 5 points each for Android and iOS apps. And a maximum of 10 points for the reviews gathered on the App Store and Google Play respectively. Our apps have thoughtful workflows and a sleek UI. They can compress great volumes of data – like organization charts – into easy to view and use, mobile adjusted items. Why is media presence important? Because social is not only the disseminator of content, it is also the direct path that customers often take to register complaints or voice approbation. GetApp combines the total number of fans and followers tools have on Facebook and Twitter and awards 15 points scaled to the category average. 5 more points can be earned when tools are pitched against category leaders. This brings the maximum to 20. CakeHR has always considered social interactions an integral part of its growth. Our Facebook and Twitter accounts aren’t about vanity metrics. We use them to gauge what our tribe wants, create relevant content (Do you know ours is one of the “Best HR Blogs to Follow”?) and keep our finger on the pulse of customers. We’re covering this last, but it is far from the least. GetApp places a high premium on security. Vendors who are being considered fill out an exhaustive survey based on the Cloud Security Alliance self-assessment form. A tool can earn 15 points, one for each question. And it can bag an additional 5 points for security certifications and privacy shields. In the event of a tie, the security total takes precedence and is used to determine the winner. CakeHR respects this discernment on part of GetApp. Human Resource data is about the most sensitive information that can be stored in the cloud. This is why we support audit logs, encryption for data at rest, HTTPs for all pages and security alerts. Role-based permissions allow only authorized individuals to access company information. And strong password policies mitigate the impact of human errors. We know all about the numbers and the criteria but we wanted a subjective take. The 65 points we’ve scored aren’t all about dry and technical things like APIs and encryption. Many solutions have these provisions. But they don’t make it to the list. The human part of the compilation is the reviews. And CakeHR excels at human! If you still haven’t invested in HR software for your business then what are you waiting for? Perhaps these 15 reasons to use HR software will help to persuade you to make the investment sooner rather than later.